Hyderabad Central University scholar Rohith Vemula’s tragic death has created a sense of grief and outrage all over the country. Students are at unease and the nation perhaps for the first time after years reflecting the somber mood that something terribly wrong has happened. Rohith’s extraordinary letter in death has become a classic perhaps for every one of us to keep us, read and reread it and ponder over as who is responsible for Rohith’s untimely death. There are a number of people right from the right-winger to left thinkers to Ambedkarites who are decrying Rohith’s suicide while many making this act as a heroic. I want to make it very clear that Rohith was not a coward even when his last act showed that he had lost hope from all corners perhaps including his own people who he might have thought would help him. We are happy that teachers are not taking classes and seeking revocation of the suspension of these students but why has it taken so long since August. Can’t we understand and read a young sensitive mind who come under tremendous pressure with loads of hope from families that their children will study and will get a job. Definitely many become vocal in politics and social movements which is important but none can deny that the hope and aspirations of their parents is that they will study and find a stable honorable lives for them. Hence, Rohith did not get justice from the University, which remain absolute brahmanical in nature with Dronacharayas sitting and wanting every one to become an Eklavya. Today’s Ambedkarite students are not ready to become Eklavya and that is the root cause of brahmanical games of ‘saam daam dand bhed’ to crush the revolutionary spirit of Ambedkarism which has become the main challenging ground to brahmanical hegemony. Therefore, it is important to understand that while the parochial brahmanical forces were doing their work what did we do or plan to do in future to stop such desperation of our bright young children. We can’t allow this to happen but for that we need lot of introspection, which people ignore deliberately in their blame game, which of course is well known to all of us. My only point is that it is time we create a strong support and solidarity group of people in every city which not only support them in their future endeavors but most importantly act on time to suggest the right guidance which does not destroy their life due to our rhetoric and jargons. After May 2014 elections, the Hindutva forces have been active in the University campuses all over the country as education is the most important sector for the Sangh Parivar. ABVP is hyper active and they are after all those who differ with them. Ambedkarite students have become the ‘biggest’ ‘threat’ for them apart from the left. The Hindutva was quite comfortable with Congress’s upper caste seculars who did not change radically. 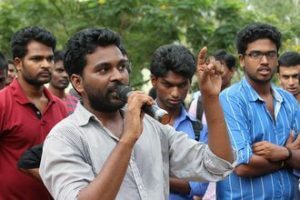 The left associations and student Unions in the past had been anti reservationists and therefore there was a huge credibility crisis particularly whenever question of their relationship with the Dalit Bahujan organisations came into focus but off late organisations like AISA have been raising this issue and worked more on the Dalit issues which is a positive side. Dalit groups too have understood that if there is a possibility of alliance it could only be with the left progressive elements who have to focus not just on imperialism and capitalism of international variety but Brahmin bania imperialism in India too. Unless we speak unambiguously on the brahmanical imperialism in India and the way it enslaved people and tried to crush their spirit, we can’t really eliminate it. The Ambedkarite-Periyarist—Phule-ite Bahujan philosophy and social action has revitalized the entire movements and they become the real challenge for the brahmanical elite class who are ready to discuss ‘pros and cons’ of ‘international terrorism’, American imperialism and capitalism but glorify ‘Indian’ culture as the ‘most’ ‘tolerant’. So the Hindutva is comfortable in countering every one on international ground or when you start speaking on Islam as they want to look more ‘liberal’ in all terms than the theocratic Saudi regime. Dalit Bahujan discourse is a nightmare for Hindutva intellectuals as well as those who claim to be ‘liberal’. I can vouch many of the so-called intellectuals, sarkari babus in our secretariat; professors in our universities have filled with filth regarding Ambedkar. Once you speak to them their faces turn pale. Dalit Bahujan discourse actually exposes the brahmanical myth of tolerance and multiculturalism and therefore there are attempt to crush this spirit through various means. When you fail through a counter arguments then bring the ‘power’ of administration to suppress these voices. Yes, the biggest power to crush rising Dalit Bahujan assertion in India is actually brahmanical manipulation in power circles whether it is administration, judiciary and finally horizon of media which is totally in the control of corporate misinterpreting everything. I would just narrate one incident on January 18th at the Shastri Bhavan in Delhi when the students of various Universities in Delhi protested. The media was making a mockery of the students. Some of the photographers were aiming to take photographs of some of the girl students who were standing at one corner talking among them, perhaps smoking. The photographers wanted to take a photograph perhaps for a negative comment. There was verbal altercation when a girl stopped them to take photograph or video of a private affair. The reporter including the Times Now was angry and was shouting,’ if we put our camera down, the police will beat them up and none would care for them.. aukat samajh aa jayegi’ he said. Many of the reporters wanted to walk out from the place but perhaps the incident was so powerful that they could not do so. At four when all the students came from JNU, the police did not give them time and started using water cannon. I was taking photographs but became very upset and in exasperation I shouted this is unethical. A media photographer who was taking photographs asked why you think police is wrong? How will they handle these students who are hooligans. Does the media feel that the protesters have no right to protest against something wrong has happened? We can understand police’s duty but when there is section 144 then why police allow the protest? When the protest is there why cant the Ministers or bureaucrats come and speak to students? Why they allowed the students to be handled by the police who misbehaved with them. Today, HRD Minister Smriti Irani said this is not a caste issue. BJP is trying to convey that Bandaru Dattratreya is a backward caste person. A TRS MP said on TV that the Rohith was not a Dalit. What do they want to convey. They say that Rohith has not charged any one in his letter written before suicide and that he was suffering from depression. We want to ask who called Rohith anti national? Why is the Sangh Parivar not allowing students to organize seminars, conferences of their choices including film, Mujaffarnagar abhi baki hai when they can bring a Subrahmanyan Swamy to Delhi University and organize a seminar on Ayodhya. The entire government machinery is clearly visible here in the service of brahmanical forces and the real threat for them come from the Ambedkar-Periyar-Phule discourse and therefore attempt to deify Ambedkar and deny his literature to people and crush the spirit of those who swear by his idealism. Many of our friends were upset with political leaders visiting Hyderabad University but why are two chief minister M/s KCR and Chandra Babu Naidu silent on the issue? The PM who tweet every day has kept quiet so far though he speak through his arrogant spokesperson appearing on various corporate channels. Rohith’s letter to Vice Chancellor on December 18th is widely been ignored where he calls him worst than Donald Trump and asked him to give suicide pills and a rope to all the Dalit students so that the University can live in peace. This is a castigation of the entire structure of Hyderabad University, which has seen shameless caste discrimination over the year. There are reports that around reports that in the past 15 years over 10 Dalit students have committed suicide inside the Hyderabad University Campus, which indicate how the University has become a slaughterhouse for the Ambedkarite Dalit students. We don’t know whether the University ever felt necessity to look into these affairs as why one community of students feeling suffocated and isolated. Unfortunately, in the caste ridden Indian academia the answer to these questions would be that they don’t have ‘merit’ or the people suffering from depression or other psychological disorder as the Sangh Parivar elements are now claiming about Rohith. Sangh Parivar’s lie machine is at work. Having been exposed on the issue of their anti-Dalit stand, they are now trying to save face and charging Rohith and other students with various charges including being arrogant and terming every one as ‘brahmanical’ who disagree with them. The fact is that Rohith’s letter to vice chancellor is an eye opener and it is surprising why the VC did not even bother to speak to him and other boys. Was it because they were Dalits and particularly Ambedkarites ? It is now coming to light now that the action taken against Rohith and his friends were on the basis of order from Union HRD Minister Ms Smriti Irani who claimed that her Ministry does not interfere in the ‘University’ administration’. Ms Irani has become the hallmark of what is ailing our educational system. She has lost the plot as she continue to play in the hands of Sangh Pracharaks who are determined to destroy our education system and corrupt it with their brahmanical thoughts. It is not without doubt that people like Deenanath Batra are welcome in the HRD while a sinister campaign is launched against the respected historians terming them as ‘left wing’. It looks as if the Ministry is on the fast mode to change everything, which has rightly been defined by Sitaram Yechury as Hindutva Revival Department (HRD). The letter written by Smriti Irani on the instance of another Minister from the state Mr Bandaru Datratreya clearly violate the autonomy of an institution which Ms Irani is claiming so proudly to show her innocence. The worst part is the Hindutva machinery outside is terming now that Rohith was suffering from some mental disorder or depression because his friends had not supported him. Whether Rohith’s friend supported him or not is another matter but in this case the Hindutva’s monsters can not shy away from the fact that they are prima facie the people who were responsible for his death. The Vice Chancellor of the University was simply an administrator who did not stand in front of the pressure being put by the political leaders and a letter from HRD minister was treated like an order. Today, many in the media are crying how a Dalit student has faced the wrath. Some are suggesting that this is not caste violence but a case of two groups fighting with each other and political leaders jumping in to support their group. This is a clear attempt to deflate the whole issue of caste prejudices prevalent in our institutions. Sangh’s open agenda is to kill the rebellion spirit among students particularly those with Ambedkarite stream hence it is working on multiple agenda. One side, it is pushing Ambedkar to a demi god status by erecting memorials many of which were being demanded by Dalits for years but at the same point of time it need to be know whether the government is sincerely created these monuments or spending money from Special Component Plans for Dalits. 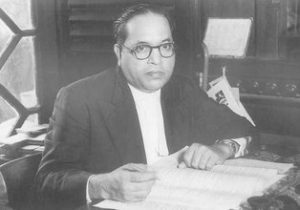 At the time when Dalit scholars are not getting scholarship, when the government has stopped all the welfare measures in our villages, when the land and livelihood of our people are being snatched to make way for big corporations to loot them, it is Hippocratic to think that this government respect Ambedkar and his socialist vision. Ambedkar might have issues with various political leaders of his time but it does not mean he was pro Sangh or pro capitalist both of whom he despised terming the Hindu Raj as calamity for the nation. The government has clearly do not believe in Ambedkar’s socialist agenda and hence the students and all the followers of Dr Ambedkar who are alive because of his writings and life for the cause have become a threat for the Hindutva status quoists. As Ambedkar said, he would love if there were Voltaire’s here who could dissent against the brahmanical hegemony, which that was complete. Today, this hegemony is being challenged by none other than young revolutionary Ambedkarites who did not pick up guns but who with their thoughts and ideas have become the biggest dissenters of our time against Brahmanism which is being claimed by Bandaru Datratreya and others like him as being ‘anti national’. Yes, speaking against brahmanical crookedness in India is next to being anti-national in the eyes of those who did nothing except selling this nation to foreign multinationals and were absolutely absent during our freedom struggle. Institutions feel offended if you suggest you want to speak to student on Ambedkar’s vision of India. We have faced this many times. At one premier institution in Delhi where I was a guest speaker two years back, I was not allowed to speak by a senior faculty when I raised caste question. Can you imagine this happen in a prestigious medical college of Delhi and student and faculty remain helpless as none wanted to disturb. The brahmanical status-quoists under this government have been blowing their trumpet very high. They have become extra powerful thinking they can do anything at their whims and fancies because they think nothing would happen to them. The education system suffers from the Dronacharya syndrome. The teachers don’t want Dalit students. If they are there, they want to make them ‘mainstream’ which means you don’t ask any uncomfortable question but most of the time complains about you. Most of them are patronizing and at many central Universities, which I call, have been converted to merely primary schools where master scholars are suppose to just listen. Many of the students who wanted to speak to me about their subjects stop because they suggest that if they write of what I tell them will not fetch them good marks. So even if you don’t like Lord Rama or can expose the entire Ramayana or Gandhi, you have to love them in your answer-sheets otherwise you may lose good marks. What kind of institutions are we making? What kind of students will we create where you have to just appreciate the brahmanical dharma as the best culture of the world, the most tolerant, vibrant and in this context the Dalit Bahujan thought is a direct challenge. None other apologetic of tolerance brand will challenge it as the brahmanical supremacy has to be exposed through their own mythological crookedness and when you force students to write about their greatness then one can understand what kind of scholar will we create from the corrupted institutions. Go to any university and seek the books of social sciences. How many of our students in the schools and colleges know about Savitri Bai Phule, Joti Rao Phule, EVR Periyar, Sahu Ji Maharaj or even Bhagat Singh. All the students have known to these icons through their socializing and external efforts and not through our regular curriculum where you find Gandhi, Ram Mohan Roy, Vivekananda, Dayananda Saraswati and many more. Ambedkar is reduced to the constitutional drafter and Bhagat Singh, a hotheaded person who disagreed with Gandhi. Now we are getting new icons in history who are Deen dayal Upadhyaya and his integral humanism, Veer Savarkar who sought relief from the British and apologized, Shayama Prashad Mukherjee and many others who mostly sided with the British. Definitely our educational institutions are under the brahmanical assault which got emboldened under the new power elite took over India but Rohith’s death has a lot to be answered by all others who were he close associate. Many friends suggest he should have fought but we must realize he was fighting since August so what has happened? Why did he commit suicide? Why did he write that he is still alone and felt unwanted since childhood? A person who is with the social movements and yet feeling lonely is a big answer to many things. We must understand that as a student his first aim was to complete his education as he was carrying a lot of hope from the family and friends who were supporting that time. Since August, he had not got his scholarship money from the university and for the past 12 days he was out in open. People came and joined hand but it too delayed response when the things were lying since August. Why is that we could not resolve this issue? Why is that friends in and around Hyderabad who might be in the faculty, teachers, academics, administrators ever tried to resolve this issue which should not have been a big deal even if the Sangh was asking for their rustication. Was Rohith frustrated that there was no solution in the sight and that merely sitting on hunger strike or dharna is not going to take him anywhere? It happens. We have seen when we fight for a cause. Many times the cause is left deep aside and the leaders carry one with the issue. Their interest is not in solving the issue but carrying it forward, making noise. These are dark realities of our time. You might be looking the issue from your ‘big’ angle but for those for whom every single minute remaining outside and losing their time is painful, agonizing is a terrible wait. People don’t wait when justice is delayed whether by the delaying tactics of people or legalities of judiciary. For a young fresh sensitive mind, these are hard to bear. He fell to it. Definitely that is not a crime. It is our abject helplessness. When one sees no solution in sight he become a loner or at the end lose hope in everything including himself. When one sees becoming a tamasha himself a sensitive soul will walk out. That is the reality of our time. I can vouch for it as I have passed through this phases in my life feeling utterly lonely from childhood and it remain till today even when I am very active with people. It is terrible. We can fight with our enemies but we become helpless when those we expect to support and stand with us are not there or just using it. Dalit Students need peer support groups who are in effective positions around them, who can guide them and resolve the issue through negotiations or even by approaching to right authorities or courts. Young minds cannot sit on indefinite dharnas in front of those where none listen to you, this deaf and dumb government but from our side, we cannot afford to lose them and hence it is the duty of those who can influence administration and staff locally. Universities must be given clear guidelines, as they have no right to destroy the career of students and must be given everything in writing. The government departments whether educational institutions or secretariat never give anything in writing or never even acknowledge a letter. This must be made mandatory as what efforts the institution did to bring the students back to his studies. Universities or law cannot be for retribution otherwise there is no difference between us and IS. The University Vice Chancellor need to own the responsibility apart from the Union HRD Minister and the other minister Bandaru Datratreya. As I said Dalit students face deep rooted prejudices in our campuses and isolation is not the issue. Will the government ask the universities to form special committees so when such cases come they are handed sensitively? Can we ask the government to make stricter law so that students do not face harassment because of their caste, identities and ideologies? Let universities and colleges become space for diverse opinion, dissent and sensitive to the cause of society, which will help India in creating an enlightened society. We must remember that youth will revolt against parochial and vicious ‘moral policing’ of all kind if allowed in the campus. Ambedkarites youths want a modern democratic republic of Dr Ambedkar’s dream and perhaps that is the biggest challenge for those whose dream a Manuwadi India. Rohith’s death has clearly shown the line that it is fight between Manuwad and Manavvad and you have to decide which side of ideology do you wish to associate as your decision will make or break India.